The beginning sets the tone. 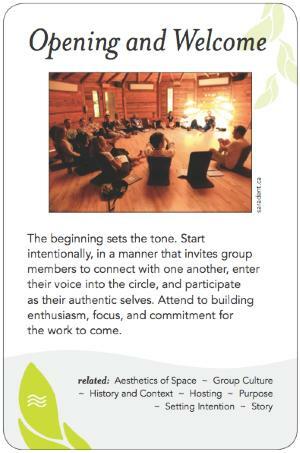 Start intentionally, in a manner that invites group members to connect with one another, enter their voice into the circle, and participate as their authentic selves. Attend to building enthusiasm, focus, and commitment for the work to come. We are assuming we are facilitating 'in the room' with a group, so there are assumptions already established around, for instance, the invitation, the physical space and place, and many other factors. The importance of check-in, transferring in, collecting, the transition between the outside world and the inner world of the group... created in that moment of gathering, a unique group different from any gathered before or after, we all will be changed by what happens right now. How the facilitator shows up is important here: including the meeting begins... being centered, greeting people as the participants enter the room which communicates an enthusiasm for each person's choice to be there, to contribute and to create the only thing that can be created. Tone of voice, body language, eye contact, silence, pacing, on the part of the facilitator can all set the tone for the gathering very powerfully. The check-in process provides an early opportunity to have each person's voice heard ("you're not in the meeting until your voice is heard" P. Block); this can give the facilitator a real sense of each person's energy, interests, and state of being in that moment. The use of silence early on in the gathering can again shift from an outer world to an inner world of this group gathered at this time. The use of humour can lighten even very serious gatherings and invite a holistic contribution rather than simply an intellectual one. Some early conversation about norms or ground rules generated from the group establishes a culture for the gathering, of how we are going to be together, how will we treat each other, how will we navigate the 'groan zone' for instance. EDIT: Add in something about "contracting"
Don't do things that aren't related to your work, both content and process wise. Openings and welcomes must have integrity with the rest of the process. The facilitator has a moral responsibility not to agree to something that is actually going to set the group up to be coerced, or manipulated, or serve a hidden agenda. Icebreakers, also sometimes called "warm-up activities" are short interactive activities at the start of a group event that help people begin to feel connected with one another, oriented to the purpose of the gathering, and comfortable participating. They are especially useful when participants are unfamiliar with one another and/or are coming together as a group for the first time, or if accustomed to more formal relationships, to relate to each other more informally or more intimately. Icebreakers address the awkwardness, the lack of relationship or trust that may exist when a group of people first comes together. The intention to help people feel welcome and invited to actively contribute grows from an understanding that learning and working together is as much a social process, as a task-oriented one. Icebreakers can help those gathered feel at ease; and in lessening anxieties, free up energy for participation. The opportunity at the start to connect emotionally and build rapport with other participants can have a profound effect on both individuals' willingness to engage more deeply and the development of the group as a whole. Building relationship is the core of building community, and community provides a dynamic context that supports collaborative learning and work. Effective icebreakers in the opening minutes of a gathering can immediately set the tone for what is to come, while conveying expectations about the nature of hoped for interactions. Specifically, icebreakers send the underlying message that 'you matter.' If in the very first activity each participant is invited to speak, even in a small group, the message comes across that every voice is important. If at the start each group member has some role to play, however simple, than an implicit signal is sent that every individual is understood to bring unique resources, wisdom and skills to the table. Icebreakers break habitual patterns of participants focusing on just the facilitator or convenor of the gathering, and introduce people to process culture. There is a ritualistic importance of hearing every voice in the room acknowledged at the start. Warm-up activities also serve the function of helping people become present, focused on the reason for coming together. "Why are we here?" is a question implicit at the start of any new gathering. Icebreakers can be designed to connect participants to the whole, the purpose of the group's existence. Finally, icebreakers can open up people's receptiveness to new ideas or ways of thinking. If engaged playfully, icebreakers can seed in humor, imagination and a willingness to risk, helping people get in touch with their creativity. A special caveat with icebreakers is to recognize that they may cross over cultural or personal boundaries and comfort levels. For example, icebreakers that require people to touch each other in some way or reveal personal information could violate cultural norms. The flip side of this is that in some cultures there are ingrained practices that proceed any work that may eliminate the need for icebreakers and/or cultural tradition may suggest obvious rituals with which to start any gathering that could substitute for icebreakers. Bottom line: it behooves the facilitator to understand the role of culture in icebreaking, and to assess what sort of icebreaker (if any) would be most valuable or productive in any given context. Some icebreakers play with physical energy, either with or without an element of sharing personal information. For example, asking people to mill about, physically moving around the room, while verbally connecting with others: "introduce your self briefly to five different people" (for a group of some 40-100) "move on to a new person whenever yo hear the bell ring." Or they could involve a group task such as in "knots" best used with 10-25 participants who are instructed to stand in a circle, shoulder to shoulder with arms stretched out toward the center: "Clasp a different loose hand with each of your own... and now undo the knot!" A common physical format with infinite variations asks participants to stand in a circle facing one another and invites one to begin by responding to a prompt such as "say your name," "name one quality you value" etc. Then the initiator throws a ball to someone standing across the circle who is now "it" and has to repeat the previous person's prompt and then add in their own (George, Maria; perseverance, playfulness) before throwing the ball to the next person who repeats this pattern. Another category of icebreakers invites participants to turn to a neighbor and share something. It might be "what is something you are leaving at the door, and something you are bringing in?" or "share something you are proud of that not many people know about you." A related but more time intensive category of icebreakers asks participants to form small groups (of 3 to 7, depending on the overall size of the gathering and how much time is set aside for the exercise) and share a story relevant to the purpose of the gathering. For example, "name somebody you'd want to make the world safe for" could be the prompt for an evening community meeting convened to address the challenge of reducing youth violence. And "share a story about a loss you've experienced and what/who gave you comfort during that time" could be the prompt for the opening of a weekend training for volunteer hospice caregivers. If there has been work prior to the gathering, or requested "homework" for the session, or if people are gathering again as part of an on-going series of group meetings, participants can be asked to bring something to share and/or reflect on what has occurred outside the room, leading up to the gathering-- as a way to connect around or deepen the group purpose/mission. For example, members of a multi-faith alliance coming together to explore ways to sponsor community dialog about ending homelessness could share (in the full group if 20 or fewer participants, or if more, in small groups) an object that represents 'home' for them. After the sharing these objects could be placed in the center of the circle or on a table at the side of the room to form a kind of alter to remind everyone what they desire for everyone as the work proceeds. Or members of a company engaged in a year long organizational development change initiative could reflect on one positive change he/she has experienced since the last project meeting.